ROME --- In a move to enhance its emergency multirole airborne capabilities to more effectively counter the ever-increasing risks of firefighting duties, the Italian National Fire Corps (Vigili del Fuoco) has signed a contract for the supply of three AW139 intermediate twin engine helicopters. The order, valued at around €45 million, also includes integrated logistic support and training for pilots and technicians, and encompasses an option for 12 additional helicopters. Deliveries of the three new aircraft are expected to start shortly and to be completed in 2019. Over 816,000 rescue operations occur every year countering fires across Europe, including many in Italy this year. In order to better face these challenges, the Italian National Fire Corps, part of the department of firefighters, public rescue and civil defence within the Ministry of the Interior, is acquiring the world’s best rescue helicopter capable to also carry out maritime and mountain Search and Rescue (SAR), medical rescue, and disaster relief/civil protection. The AW139 has been selected by the customer following a competitive tender launched in 2017. The 7-tonne AW139s of the Italian National Fire Corps are expected to progressively replace their AB412s helicopters which have been in service for decades. The new aircraft of the Italian National Fire Corps will feature a wide range of mission equipment, including an external rescue hoist, cargo hook with Bambi bucket provision, weather radar, multi-band and satellite communication systems, high definition Forward Looking Infra-Red / Low Light TV (FLIR/LLTV) system, Leonardo’s high definition mission console with digital recorder, high definition down link, Leonardo’s Optical Proximity LiDAR System (OPLS), Night Vision Goggle (NVG) capability, new generation Trakka searchlight, emergency floatation system and external life rafts, external loudspeaker, medical rack and bubble windows. The AW139 design incorporates a large spacious cabin accessed by two sliding doors, powerful engines that deliver class leading performance and safety, making it the aircraft of choice in its weight class. Excellent one engine inoperative capability ensures the aircraft can accomplish the most demanding missions while maintaining the ability to fly away safely in the rare event of an engine failure. The cockpit features the latest technology including fully integrated avionics, a 4-axis digital Automatic Flight Control System with dedicated SAR modes and large flat panel colour displays - reducing pilot workload and allowing the crew to concentrate on the mission. 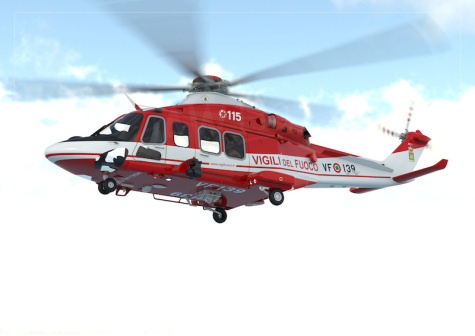 The AW139 has also been selected by and is in service with the Italy’s Customs and Border Protection Service, State Police, Coast Guard and Air Force. The various Italian Government agencies operating the AW139 are able to benefit from shared logistics, training and support systems. This latest selection by the Italian National Fire Corps brings the total number of AW139s chosen by all of these Italian Government operators to 56, covering a wide scope of public utility roles including law enforcement and homeland security, patrol, special operations, search and rescue, command and control, government/VVIP transport, disaster relief and training. Many law enforcement, maritime/border patrol and security agencies from countries around the world, including Italy, the UK, USA, Japan, Republic of Korea, Malaysia, Sweden, Spain, Estonia, The Netherlands, Brazil, and UAE, have selected or are already operating the AW139 to fulfil their requirements. Over 270 customers from around 70 nations have already ordered over 1100 AW139s, more than 900 of which are in service, confirming itself as the bestselling aircraft in its category.